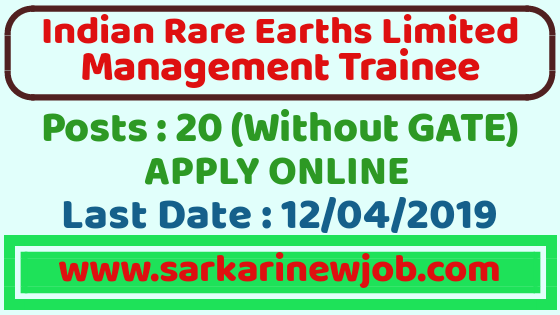 Indian Rare Earths Limited Management Trainees Recruitment 2019 - Sarkarinewjob.com A ultimate job portal to provide employment news. IREL Management Trainees Recruitment 2019 PSU without GATE : Indian Rare Earths Limited (IREL) invites online applications from young and dynamic graduates for 20 vacancies of Management Trainees post in disciplines namely Mechanical, Mining, Electrical, Chemical, Mineral and Finance. Eligible and Interested candidates may apply online for IREL MT recruitment 2019 from 23rd March 2019. 12th April 2019 is the last date of IREL recruitment 2019 online application form. Check out eligibility criteria, vacancies, exam pattern, selection procedure, & IREL notication PDF. · OR 5-year Integrated Master degree in (Mechanical/Mining /Electrical/Chemical/Mineral) Engineering from recognized/approved Indian University/Institution with minimum 60% aggregate marks of all semesters/years. · Candidates who have completed their Degree on or before 31 Dec 2018 are only eligible to apply. The candidates appeared/appearing in final year/semester and awaiting their results (of minimum Essential qualification) are not eligible to apply. · For Finance Discipline - Candidates must have qualified CA/CMA OR B.Com and MBA with 60 percent marks. Exam Centre: IREL MT written exam will be held in six cities. These are Delhi, Mumbai, Bengaluru, Trivandrum, Bhubaneswar, and Guwahati. General/EWS candidates are required to pay 250 Rs. non-refundable application fee. All other SC/ST/PwD/ OBC(NCL)/ExServiceman/Women candidates are exempted from payment of application fee. Exam Pattern of Written Exam : The written examination will be held for a duration of 2 Hours comprising of two Papers.